‘The mountains are calling’ is what I used to tell myself every time I came across photos of my friends vacationing up north, be it the mighty Himalayas, Ladakh or the stunning north-east. After years of unsuccessful planning and travel announcements, I finally made it to Himachal Pradesh with a few friends getting together and planning a super awesome trip. With a weeks’ time in hand and some places on our mind, we set off to the mountains. A railway journey from Pune to Chandigarh and a cab for our further destination was booked. Our first stop was Prashar Lake. 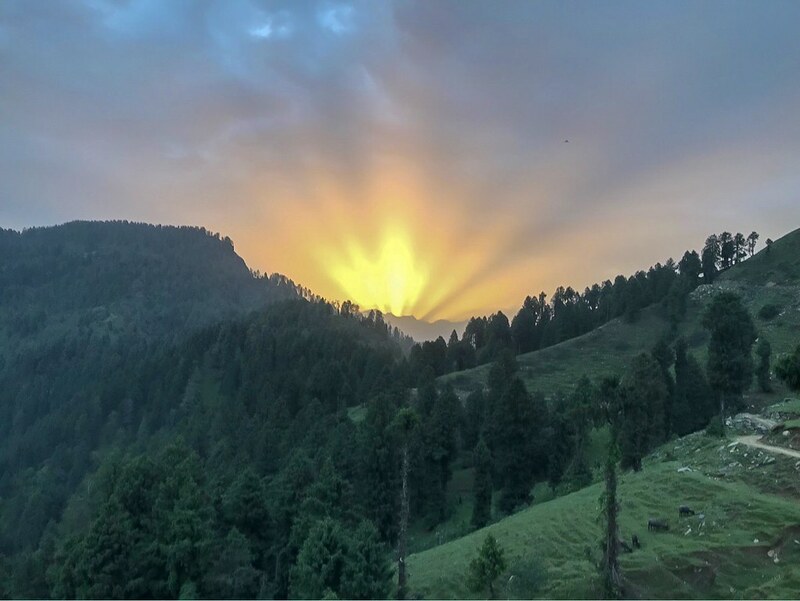 It is around 64 KM from Kullu and roughly 49 KM north of Mandi. Our first night here was spent camping in a tent, a 10-minute walk from the lake, overlooking the mountains full of Deodhar and Pine trees. Camping at the lake is not allowed but people can camp a little further from the lake. The temperature hovered around 13 degree Celsius in the morning as I woke up. The golden light radiating from behind the mountains filled the sky and I witnessed one of the best sunrises of my life. After a simple breakfast of parathas and chai, we headed to Prashar Lake. 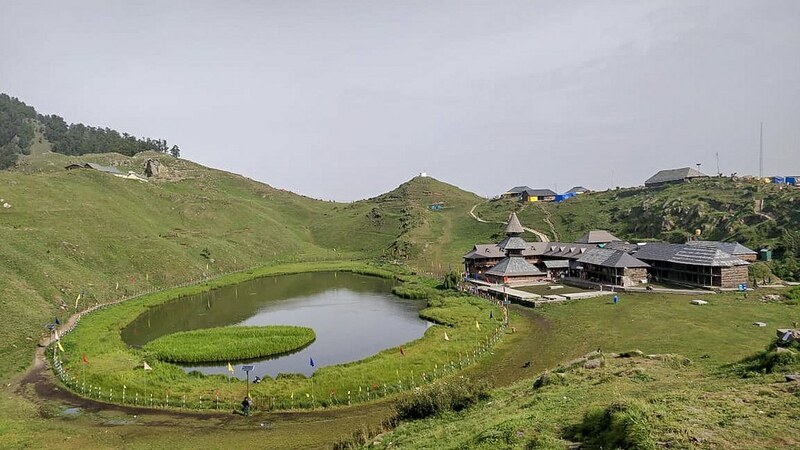 Located at an elevation of 2730 m above sea level, Prashar Lake is famous for its three storied pagoda like temple dedicated to sage Prashar. In the midst of the Dhauladhar ranges in the Kullu Valley, the lake has a charm of its own. There is a floating island on the lake which is known to change its position and move around the lake. While interacting with the locals, they informed that the actual depth of the lake has not been found out yet. There have been efforts to find out the depth but nobody has been successful till date. Our next stop was the ever buzzing Kasol. Once a tiny hamlet, it has now grown into a tourist hub and is filled with people, specially from Israel. Situated in the Parvati Valley, many youngsters prefer travelling here. The Israeli influence is high here as the boards of shops and the menu card of hotels is also written in their language. The town has a lot of options for accommodation. Be it tents, cheap hostels or budget to luxury hotels, there is something for everyone. Kasol can also be used as a base to travel around. There is decent public transport (buses belonging to HP tourism or private contractors), private cabs and bikes available on hire. On the second day, we hired bikes and headed to the famous Malana village, a 21 KM ride from Kasol. After riding for an hour with an uphill climb, we finally made it to the village famous for ‘Malana Cream’, which is know as one of the world’s best hashish (cannabis). 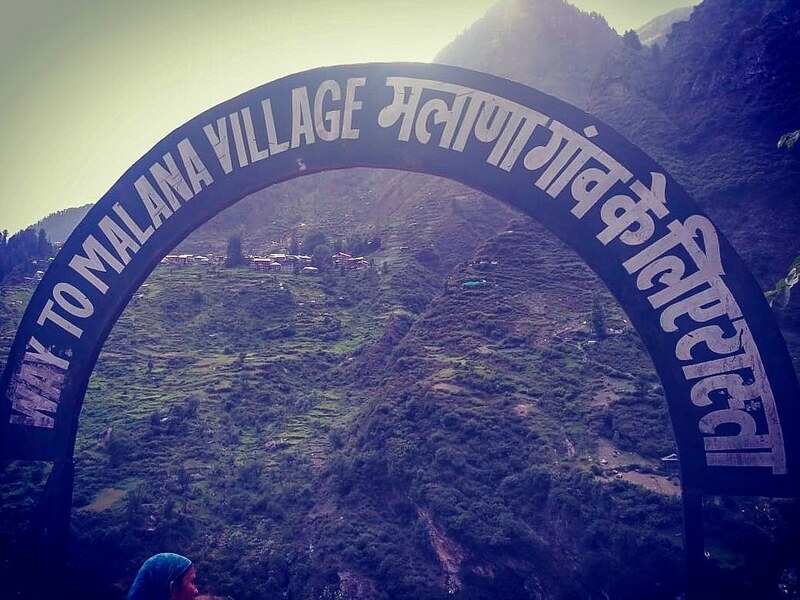 Isolated from rest of the world, Malana has its own lifestyle and social structure. The villagers believe they have Aryan genes and are the descendants of the soldiers of Alexander The Great. As we reached the end of the motorable road, we trekked (climbed downhill, crossed a river and climbed up again) ahead for around two hours to reach our destination. A word of caution it is believed you can’t touch the locals or their belongings. Actually, you are not allowed to touch anything in the village. Even in the shops, the money and goods are to be placed on the counter and taken without any physical contact. In case an accidental physical contact, the villagers go have a bath immediately. The villagers have their own set of rules which they follow. 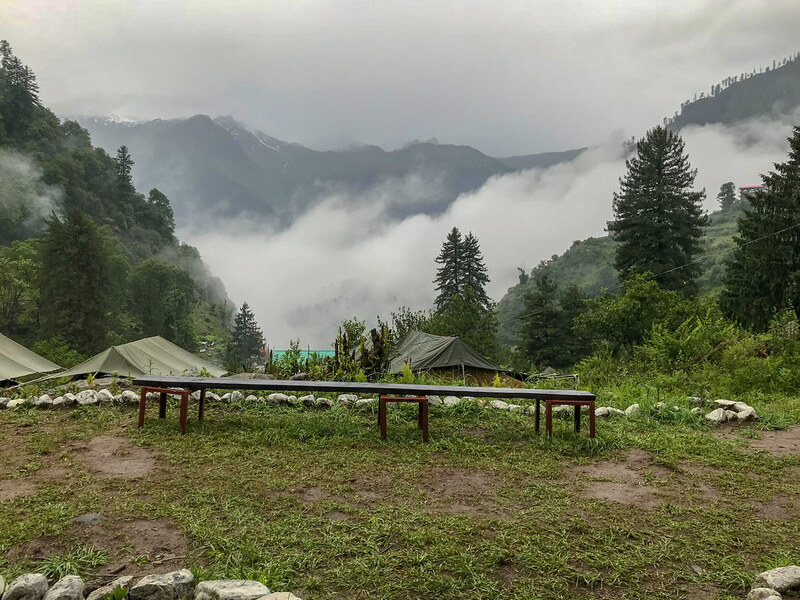 After spending a few hours chilling and admiring the natural beauty of the mounatins there and relishing some piping hot chai, parathas and maggi, we decided to return to Kasol before it got dark. On our way back, there was sudden rain (it can rain any time in this region) due to which we had to drive slowly. 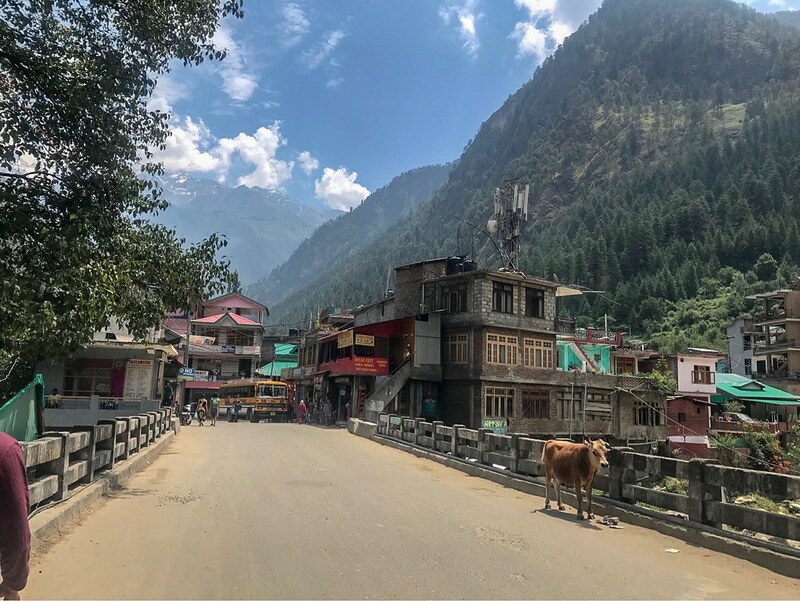 The next day we made our way to Manikaran, just 4 KM from Kasol. 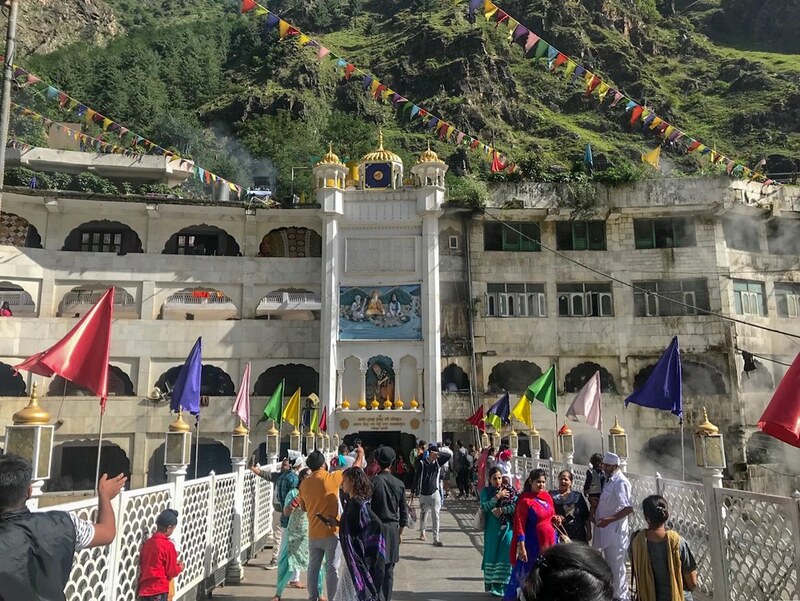 Famous for its hot springs, temples and a gurudwara, Manikaran attracts a lot of pilgrims throughout the year. Once inside the gurudwara, taking a dip in the pond was a soothing experience as it was fed water by the hot springs present in the area. Interacting with people inside we came to know that people from all around make it here and this place is always on their mind. We had plans to eat at the langar but because of too much crowd we had to cancel our plan. After the hustle and bustle of the bustling towns, it was time to head to the silent part of Himachal – Tosh. An hours’ bus journey from Kasol to Barshani and a 4 KM trek brought us to the beautiful Tosh village. A small trek through the village and crossing mountains brought us to our camping site – our home for the next two days. The sight of the snow-laden mountains right from our tent was mesmerising and the definitely best view of our entire trip. After crossing Tosh village, one can find plantations of cannabis all across the place. It is one of the revenue sources for the locals. The mountain range is a trekkers’ paradise with many options available. Vegetarian food is easily available here but you might have to shell out more for a non-veg plate. There are quite a few budget hotels and camping sites here and bargaining can get you a good deal. 1. Always carry warm clothes and your rain gear. It tends to get cold throughout the year. 2. Put your bargaining skills to use as it will help you save quite a lot of money. 3. When on a trek, carry water, torches, rain gear and some food. Listen to the instructions of locals as there is a chance of getting lost in the mountains. It is always advisable to hire a local guide as they know the area in and out. 4. When in two minds, return to your base. Don’t risk your lives in the dense forests, there is barely any phone network coverage for you to call for help. 5. Respect the locals and what they tell you. 6. When looking for hotels on the spot (especially during weekends), make sure you bargain and check the room before you finalise the deal. Some hotel staff tend to get rude at times due to increase of tourists. Posted in IndiaTagged Budget Travel, budget travel in India, camping in himalayas, camping in india, himachal, himachal pradesh, Himalayas, India, India travel, kasol, tosh camping, Travel, travel india, travelling, tugging my luggageBookmark the permalink.